Sony Creative Software continues to release updates for its Sony Vegas Pro 9 nonlinear HD video and audio editing software. Now that video editing tools have settled into support for the new HD formats like HDV and AVCHD, the focus of this new 9.0c update is enhancing the editing workflow and extending support for native editing of specific camera formats, round-trip from import to delivery. Camera support includes the Device Explorer for directly browsing and importing RED ONE (.r3d) files, round-trip support for the XDCAM EX with MP4 file rendering back to the camera SxS media, and additional support for Blackmagic and AJA cards for capture and output via SDI, HD-SDI, and HDMI. The update also adds Smart Rendering of MPEG-2, which provides faster encoding and less generation loss for projects with minimal, cuts-only editing. Additional audio enhancements include élastique Pro Time Stretching for flexible timestretching and pitch shifting, and Import Stereo Audio as Dual Mono, for example to split separate channels with interviewer's and subject's voice. The Sony Vegas Pro 9.0c software update available is a free download. Why is it so hard to build portable electronic devices that use a standard power / data plug? After all the "U" in USB stands for Universal, and lots of products do fine with it -- Bluetooth headsets with micro USB, mobile phones and media players and cameras / camcorders with mini USB, and laptops with USB connectors. But no such luck when you head out on a trip, and you find yourself packing multiple power supplies with special connectors for devices like a Nokia phone, Apple iPod player, Sony camcorder, and Dell laptop. Yeesh! One alternative is to carry one power supply with a system of interchangeable tips for powering your various devices. Even better, you can carry a separate rechargeable battery like the Energizer Energi To Go XP line of Rechargeable Power Packs which supports both USB and swappable tips, so you can recharge on the go to extend your time on the road. These are portable lithium polymer rechargeable batteries, typically with USB ports and power ports at different voltages. They include adapter cables to connect interchangeable tips, for devices from cell phones and smartphones, to digital cameras and camcorders, to netbooks and laptops (see the Tip finder). The Energi To Go XP line is developed in partnership with XPAL Power, and includes a Free Tips for Life program: register online to get two free tips per year to fit new devices, for the life of your product. For larger digital cameras, the 5.4 oz. XP 4001 charges two devices at once ($59), and the 4.9 oz. XP 4000 adds tips for camcorders to charge up to 6 hours, plus a EZ-Charger clip that charges internal batteries ($79). And for portable computing, the 7.9 oz XP 8000 also charges netbooks for to 3 hours ($99), and the 17.5 oz XP 18000 charges laptops up to 6 hours ($179). 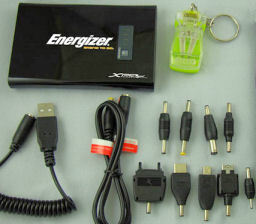 So if you're going to be on the road, and want some auxiliary power for your devices, the Energizer Energi To Go line can give you the boost you need. See my Portable Power Accessories Gallery for more on portable batteries and power options. Miccus makes wireless audio products for consumers, including the BlueBridge line of Bluetooth connectivity devices. But this post is about the simple and sleek Miccus ChargeBlock compact charger for Apple's iPods and iPhones that don't believe in removable batteries. This is a nice, simple, functional device -- basically a rechargeable battery with the iPod 30-pin dock connector attached. It's less than 2 1/2 inches wide and around 1 1/2 ounces, so just plug in your iPod or iPhone to boost it up for up to 11 hours of audio, 3 hours of video, or 3.5 hours of talk time. It has a mini-USB connector on the back to recharge with the included USB cable, LED lights for charging status, and a snap on cap to protect the connector when you carry it in your bag. The Miccus ChargeBlock is priced at $39.99. It's a nice clean design to provide a useful function to keep your iPod / iPhone going longer. Adobe has announced a new free update to its Adobe Creative Suite 4 suite, Adobe Premiere Pro CS4 version 4.2. The previous update to Premiere Pro in June enhanced support for the RED camera, popular video hardware, 64-bit systems, and interoperability with Avid software (see previous post). This 4.2 update to Premiere Pro adds native support for Panasonic’s AVC-Intra format, so you can work natively to import, play, and edit AVC-Intra clips with no transcoding or rewrapping. WIth this tapeless workflow, you can edit directly off the P2 cards, or on your local drive. Premiere Pro supports the 50 and 100 Mbps data rates, and 1080 and 720 resolutions at the 24 to 60 frame rates. You also now can transfer Final Cut Pro 7 projects directly to Premiere Pro CS4 with FCP XML interchange, without conversions or re-rendering, and while preserving common effects and transitions. For more details, see the Premiere Pro CS4 version 4.2 datasheet, and a video demo on Adobe TV showing the end-to-end workflow. The CS4 updates are available at no cost via the Adobe updater and from adobe.com. Trial versions are available online for download. Adobe has really extended its Photoshop brand, from desktop to online, and now to mobile. There's the legendary Photoshop CS4 for advanced professional photo editing, now with an Extended edition expanding into 3D and motion. And there's the more accessible Photoshop Elements for consumer photo organizing, enhancing and sharing. And the brand has moved online with Photoshop.com, a free service for uploading and organizing your photos and videos online, editing with fixes and enhancements, and sharing on social-networking sites or on Photoshop.com galleries. It's available in the Web browser from your computer, directly within Photoshop Elements or Premiere Elements 7, and from compatible mobile phones. The ability to download applications to smartphones has allowed Adobe to extend Photoshop.com Mobile from Windows Mobile phones to the Apple iPhone last month, and now to Google Android phones. With Photoshop.com Mobile for Android on the Verizon Droid (see previous post), you can flick through thumbnails of your photos on the touch screen, and view full-screen and in slide shows. 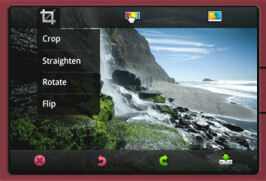 Then use the left drop-down menu to tighten up the photo with Crop, Straighten, Rotate, and Flip, the center menu to adjust Exposure, Saturation, Tint, and Black & White, and the right menu to apply Soft Focus to add a subtle blur for artistic effect. The iPhone version also offers a Sketch tool to make photos look like drawings, plus effects including Warm Vintage, Vignette, and Pop. Photoshop.com Mobile saves a new version of your changed photos. It also has Undo and Redo options so you can freely experiment with multiple operations. You then can upload your photos and edits to share online at Photoshop.com, which includes 2 GB of free storage (or sign up for a plan with more). And you can access and view your online photos from the phone. On the Android platform, Photoshop.com Mobile can automatically upload pictures in the background, even while you are using other applications. So far, so good, though I'd like to see more viewing functions, to browse the photos organized by folders (and camera vs. stored images, which should help with the visible delay in updating thumbnails), and with the ability to zoom in to see details. And it would be helpful to have some ability to see the photo attributes and rename saved images, so they could more easily be shared though alternate means such as messaging and email. Even in this first version, Adobe has done a nice job with Photoshop.com Mobile to create a fun -- and free -- tool for cleaning up photos, especially before uploading to Photoshop.com. If you want to customize your iPhone -- or other mobile phone -- with distinctive ringtones, then Sony Creative Software has a disc for you -- the Sony 1,000 Ringtones DVD. That's enough clips to assign a different sound to each of the callers in your contact list! Priced at $19.94, and containing literally 1,000 sound clips, the disc includes 300 musical themes, 600 "Hollywood" style sound effects, and another 100 spoken words and phrases. It also includes a tutorial video(in both Mac .MOV and Windows .WMV formats), showing how to sync and install ringtones on the iPhone, plus demo versions of the Sony digital media applications. The Musical ringtones are named for the spirit they evoke, with funk, dance, classical, space, and other styles. The Sound Effects also cover a broad range, from aliens and lasers, bells and alarms, animals and insects, instruments and tools, plus classic effects like "Air Blowing On Plastic Wrap" and an always-appreciated Flatulence collection. And the Vocals range from fun to goofy, from "Answer Me!" to "It's Your Mother" to "Yo Yo Yo Yo Yo Yo Yo!" 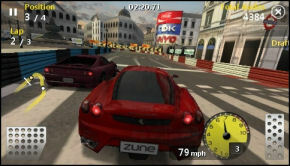 The ringtones on the disc are ready to use, without any additional downloads or editing or copy protection issues. The clips are provided in two formats: plain .MP3 for previewing on your computer or playing on many devices, and the iTunes .M4R ringtone format, ready to sync to the iPhone. To install a ringtone, double-click the .M4R file to add it to your iTunes Library in the Ringtones category. Then check the Sync settings for your device under Ringtones to choose to sync the clip to your device. Finally, sync iTunes with your device, and then select the ringtone on your iPhone, under Settings, Sounds, Ringtone. The Duracell Power Reserve line of portable chargers are rechargeable Lithium Ion batteries packaged in several sizes to provide additional power on the road for portable devices, from cell phones to media players to even some digital cameras. These don't try to provide adapter tips for all your various devices (see previous post on Energizer Energi To Go). Instead they feature USB and/or mini USB ports for compatibility with the growing number of USB-powered devices, and are recharged through USB (from a computer or USB wall charger). For other devices, you can use the USB adapter / cable that came with the device to connect to a custom interface. The Duracell Pocket Charger ($19) is a 500 mAh pocket-sized, supplemental charger for cell phones, providing up to 60 percent more talk time. It has a swinging miniUSB charging arm. The Duracell Instant Charger ($29) is a small (~ 3 1/2 x 1 1/2) 1500 mAh charger with a USB port, plus miniUSB (and cable) for charging, and a power switch. It provides up to 180 minutes of backup power for cell phones and the iPhone, and 45 to 50 hours for iPods like the nano and classic. The Duracell Powerhouse Charger ($49) is a 2000 mAh device that can charge two devices at once, with a USB port and miniUSB arm, and power switch. 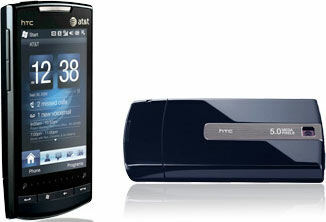 It provides reserve power for cell phones, PDAs or MP3 players, and even many digital cameras. These allow you to bring along backup power when you're on the road, in a small, light, and convenient package. Today's cameras are getting smarter, to try to make a good shot no matter how informal we are at shooting with them. But as cameras get smaller and lighter, the biggest issue is simply holding them steady enough to get a clean shot, especially in difficult situations like low light, high zoom, or long exposure. And this is even more of an issue with pocket camcorders like the Flip Video (see previous post), which work best if you're bracing yourself to avoid shaky video. One solution, of course, is to carry a tripod, or at least a monopod, but lugging along extra (and obvious) equipment defeats the whole idea of carrying a lightweight and pocketable camera for spontaneous shots. Or you can use small tripods like the Joby Gorillapod to set up for an event or shot (see previous post). But even better for on-the-go shooting instead is a small and simple device to help you steady your shots -- like the new SteadePod from Cameron Products. This is basically a retractable tape measure with 6 foot steel cable. Attach your camera to the tripod mount, pull out the cable to your camera's height off the ground, lock the position, then step on the attached footpad to anchor the other end. Apply a slight tension to the line, and you have a steady platform for your shooting. 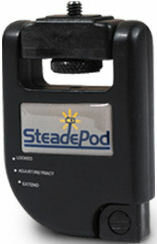 The SteadePod is compact and easy to carry (a lot simpler than bringing along a stick), and quick to set up for informal shots (and less obtrusive). Of course a tripod is still great for more formal shots, and a monopod is helpful for extended shooting, but the SteadePod fits well with taking advantage of quick, informal, and spontaneous shooting. It's priced at $29.95 ($24 street). Apple's iPod and iPhone lines are great products, but we always want to do more with them, which has lead to a proliferation of third-product accessories, from docks to cases to chargers to external audio/video connectors. Dexim has introduced some clever accessories for powering and sharing your iPhone/iPod. The new Dexim P-Flip is a foldable, portable, rechargeable dual-purpose power dock and battery, available for $54. 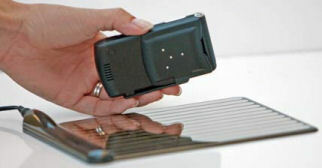 The P-Flip closes up for storage to pocket-sized, and then flips open as a desktop stand for your iPhone 3G/3Gs or iPod touch. 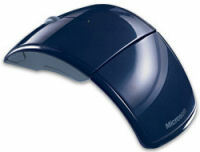 It serves as a cordless charger, or you can connect the included miniUSB cable to recharge and sync the iPhone/iPod. The three LEDs display the charge status of the device and the battery, which extends talk time up to 8 hours, video/game play to 15 hours, and music to 60 hours. You also can download the free PFlip Clock app from the Apple iPhone Store. When driving, the Dexim Car Charger for iPhone/iPod includes both a cable with an Apple connector for charging your iPhone/iPod, and a USB port protected by a rotating cover, for $15. Dexim also offers other versions of car chargers with USB port, dual USB, iPod connector, and/or cell phone tips. And to share your photos and videos on TV, the Dexim AV Adapters for iPhone/iPod include a small A/V adapter that plugs in to the Apple connector, with connectors on the bottom for two included cables: an A/V output cable (with various connectors for the different products) and a USB cable (for data synchronization and charging). The Dexim (Composite) AV Adapter has a composite video cable with stereo audio (video + L&R audio), for $39. 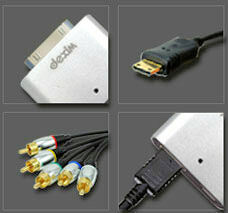 The Dexim Premium (Component) AV Adapter has a full component A/V out cable (R,G,B video + L&R audio), for $49. See my Portable Peripherals and Accessories Gallery for more on portable and computer accessories. The downside of all our portable gadgets is all the different power adapters and cables that we need to keep them charged. The problem does get easier when your devices use standard USB ports (see previous post). Yet if everything else is going wireless, why not power? We're not talking here about pulling energy out of the air, or beaming voltage around -- The idea is that someday you can just sit your device down on a table, and have it recharge without the muss and fuss of wires and connectors. Sound good? We're not quite there yet, but there are a couple companies showing the way. The first products have a charging pad that you plug in the conventional way, plus compatible sleeve adapters that you attach to your portable devices. They also include universal adapters to place on the pad, with wired micro USB interfaces for charging other devices. The Powermat line uses magnetic induction technology, so your device snaps into the proper alignment on the mat. The Powermat Home & Office Mat and foldable Portable Mat are each $99. To adapt your devices to use the mat, the iPhone / touch dock and receivers are $39, and BlackBerry battery doors and Nintendo DSi / DS Lite backs are $29. The Duracell MyGrid line (which uses the Wildcharge technology) is based on conduction, so the adapters have small metal dimples that make direct contact with the very thin tablet, but can be placed in any orientation. 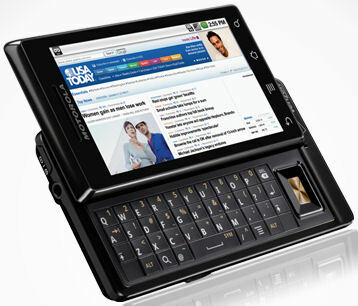 The MyGrid Pad is $49, and adapter Skins are $34 for iPhone, iPod Touch, BlackBerry, and Motorola RAZR V3. However, these products do use incompatible technologies, of course, so there will be a shake-out period in the market as the companies push to get their technology built in directly to portable devices. But someday we can hope that we can just put down our devices to recharge, on surfaces from conference room tables to kitchen counters. Small portable speakers make music much more fun, whether to listen better to your laptop, or to share the sound from your iPod or phone without requiring earphones. But even small speakers take up space on the go, especially if you want two of them for stereo sound (see previous post on the Altec Lansing Orbit and LaCie USB Speakers). The new OrigAudio Fold and Play Recycled Speakers take a significantly different approach -- the speaker elements are mounted in a paper box! 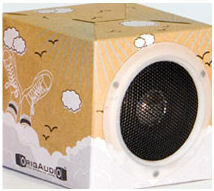 Yes, the OrigAudio speakers are made from recycled paper, and come folded flat into a 6 1/4 x 6 1/4 x 1 3/4 inch display box. You can then unfold them to assemble into 3 1/8 inch cubes -- just fold in the ends and fit the tab A's into slot B's. The pair of stereo speakers are wired together only about a foot apart, with a close to 4 foot cord to a standard 3.5mm headphone jack, which you can plug into almost any audio device, desktop or portable. 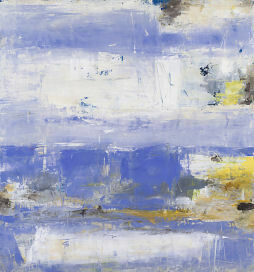 The OrigAudios are made of heavy-duty recycled paper, and are currently available in several fun designs, including CityScape, Lake, Surf Break, and Flowers. Or the Canvas design provides a neutral background to decorate with your own artwork. The speakers are self-powered, so no batteries or external power is needed. As a result they are not particularly loud, so they're a better match for personal listening and small groups than blasting at a party. 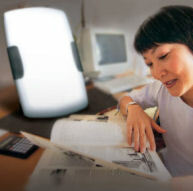 The OrigAudio speakers are a fun idea, for travel or for decorating your workspace. And they are only $16, available directly from OrigAudio. And there's more to look forward to -- OrigAudio also offers custom designs for larger orders, with different materials and a second triangular design. Entries posted to Manifest Tech Blog in November 2009, listed from oldest to newest.